In Chapter 33, the final chapter of my forthcoming book Holistic Tarot (coming out January, 2015; you can pre-order now! ), I talk about how I got started in tarot. 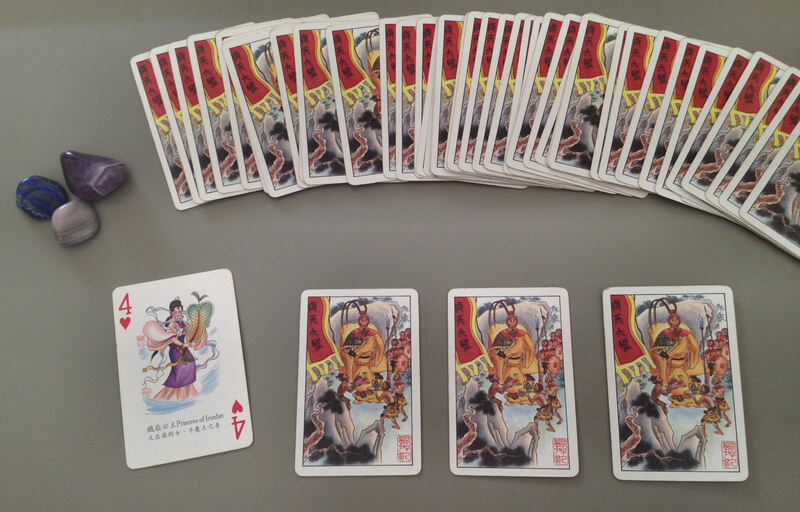 In elementary school I acquired a standard 54-card playing deck from Taiwan that depicted the characters of one of my favorite classical Chinese novels, Journey to the West (西遊記). While writing that chapter, I thought back fondly of those early memories, that large deck in my hands, shuffling carefully so that none of the cards would fall out (as the deck was large for my hands), fanning the cards out and selecting a couple to study, like maybe the characters on each card that had been drawn out into the spread held some meaning to my life. You could say it was my earliest foray in cartomancy. As I wrote, I worked from my memory of that Journey to the West deck, figuring it was still back on the east coast in my childhood home, if not lost for good. Recently, the Hubby and I cleaned out all our old storage boxes and I stumbled across that Journey to the West deck I talked about in my tarot book. I couldn’t believe it! I had managed to save it all those years and not only save it, but for reasons now lost to me, I bothered to bring it with me when I moved out here to the west coast! In my memory, the cards were huge and required careful maneuvering. However, now that I have the actual deck in hand, they’re quite small. Gasp. The cards shrunk! That or I grew up. Princess Iron Fan (鉄扇公主), though she was a minor character in the novel, has always been my personal favorite. 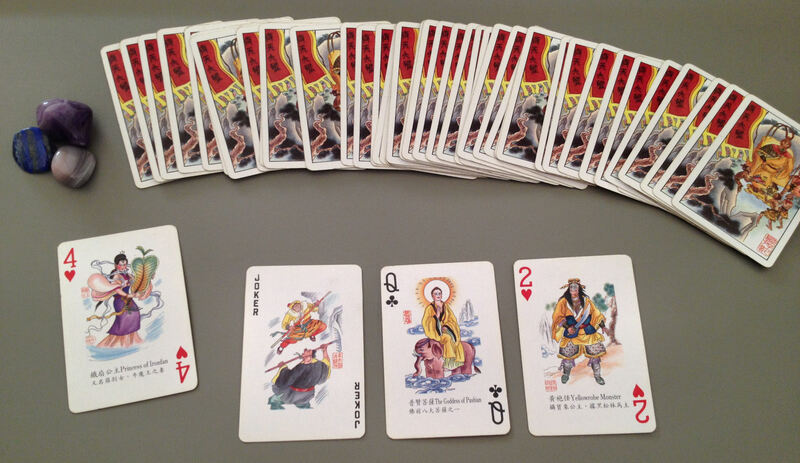 (Above, Four of Hearts.) She’s not a villain exactly, but she is an antagonist. The protagonist of the novel, the Monkey King, needs to cross a flaming mountain (or volcano…I forget) and the only way to cross it is to put out the fire, and to do that, he needs the magical iron fans in Princess Iron Fan’s possession. So the Monkey King goes to visit Princess Iron Fan and asks to borrow her fans. She tells him fat chance. The protagonist then steals the magical iron fans from the Princess! When she discovers that her iron fans are missing, she loses her cool and proceeds to battle with the Monkey King, or something like that. I’ve always sided with Princess Iron Fan. I’m just imagining someone I don’t even know coming to ask me to borrow my favorite, precious deck of tarot cards, me saying no, and then that person proceeding to steal the cards from me anyway. I’m pretty sure I’d pull a Princess Iron Fan on that person and freak out, too. For kicks, I cleansed the deck with a bit of sea salt and sandalwood incense (the energy around it felt kind of dead, probably from sitting forgotten at the bottom of a large junk box in the shed for the last decade), then tried to do a little reading with the deck. Though Princess Iron Fan doesn’t quite correspond with my understanding of the Four of Hearts (or Four of Cups), she’s very Queen of Swords, which also happens to be my signifier. Even as a kid before introduction to tarot, I was really identifying with the Princess Iron Fan card in a signifier kind of way. So here she is again, Princess Iron Fan, my signifier. I fanned out the cards just like I used to do as a kid, and drew three cards. I’m not reading with reversals, since the card backs are not reversible. Joker (oops, I probably should have taken the two jokers out first), Queen of Clubs, which interestingly enough I had pulled out earlier to take a photograph of (see above) just to show an example of the card faces, and the Two of Hearts, another card that had also grabbed my attention before starting this reading. Nonetheless, as it always turns out, the Joker couldn’t be more apropos for my reading. The Goddess of Pushian or Samantabhadra (普賢菩薩) is a bodhisattva venerated in Mahayana Buddhism. 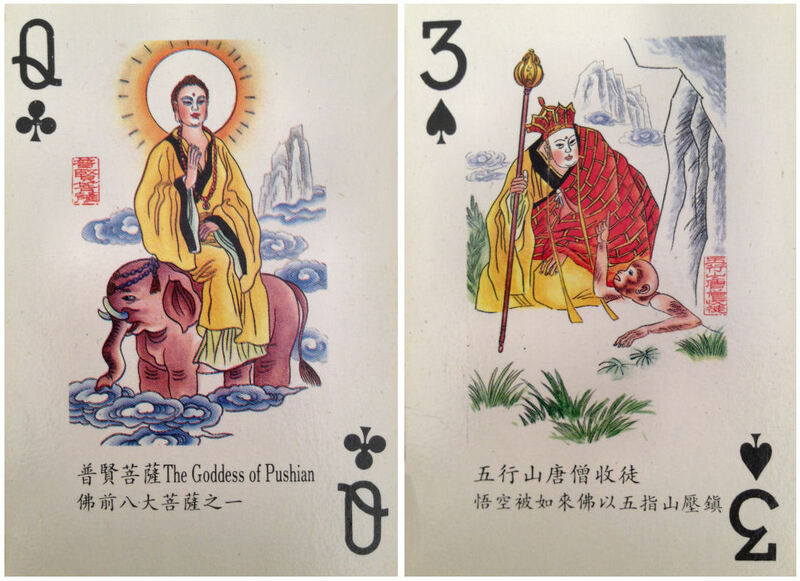 In this deck, the bodhisattva is referred to as a goddess (she), but in other texts, the bodhisattva is a he. Samantabhadra corresponds with Buddhist action, the execution of wisdom, compassion, and practice. Samantabhadra teaches that wisdom and knowledge are only valued to the extent that you can put that wisdom and knowledge to action for the benefit of other living beings. Oops, too late, Samantabhadra. The goddess brought sage advice, but I didn’t heed it. Again, a very relevant card for my reading, except I opted for the less wise, less compassionate route in that matter. =) I admit it. The Yellow Robe Monster or Yellow Robe Demon (黃袍怪) is a personification of one of the 28 constellations in traditional Chinese astrology, through a sidereal chart rather than tropical. The story goes that the demon (prior to being a demon) fell in love with a celestial maiden and the two decided to elope. Heavenly authorities stopped them and as punishment, he became the Yellow Robe Demon and she was sent down to earth and reincarnated into a human princess (she became royalty; wow, what a punishment). The demon then somehow kidnaps said human princess and marries her. A ton of other stuff happens, which leads to that Monkey King protagonist facing off against the Yellow Robe Demon. In the end, the demon is defeated and Heavenly authorities send him up into the skies to, well, basically become one of the constellations. I’m pretty sure I have skewered the storyline. Some hard-core Journey to the West fan is going to get hostile and will probably chime in to correct me. Considering the Samantabhadra card and the matter this reading relates to, the Yellow Robe Monster makes sense here. Well-played, little deck, well-played. In any case, I can’t believe this deck is still in my possession. I ended Holistic Tarot with a story about that deck and just as the book is geared up for pre-orders, by chance I stumble across the deck not even knowing it has been in my possession all along. Love it. Hey Tarot Reader, What’s In Your Bag?